"Recently I had the pleasure to give an ECDL Start certificate to one of my pupils. The ECDL certificate has allowed him to sign a 5-year contract in the Transmissions Division of the French Army." – M. Pol, IT Manager at EPIDe centre (Établissement Public d’Insertion de la Défense), Saint Quentin, France. Korean Productivity Centre (KPC), the South Korean government agency responsible for economic development, recently selected ICDL as of the programmes covered under the ‘University Capacity Building’ project. This project allocates funding for university students to enrol on vocational training programmes that the KPC feels equips students with the necessary skills to secure employment. Under the ‘University Capacity Building’ project, over 50 now offer ICDL certification courses and to date, over 23,000 students have enrolled. Click here to read the case study. “No more boredom in my classes. Students enjoy watching the slides I prepare using PowerPoint, and participate actively.” – Majeda, 8th grade teacher, Jordan. To learn more about the improvements that an ECDL / ICDL certification can bring to a teacher’s professional life, click here to read the Jordanian Ministry of Education case study. ECDL certification is currently offered in 10 of the 16 German state’s school systems, and over 3,000 teachers and 50,000 students have enrolled in the programme. Click here to read the German education ministries case study. In Chile, the Ministry of Education was seeking to introduce a recognised national standard of ICT competence while, at the same time, providing access to ICT to disadvantaged sections of Chilean society. ICDL, as provided by ECDL Foundation’s national awarding body, Fundación Chile, offered Chile Ministry of Education the ideal solution. To date, the ‘ClaseDigitale’ has trained over 37,000 public school students, and certified over 2,300 of their teachers. Click here to read the ClaseDigitale case study. “I am really glad it is an international qualification because I want to be able to study and work in a number of different countries and the ICDL is known everywhere - it is a common currency.” 16 year-old Dalyn Capes, student, Zambia. Click here to read the Zambian colleges case study. ECDL training and certification has been offered through the Italian education system since 1999. Since then, over 640,000 public school pupils and 200,000 university students have been ECDL certified in 2,000 schools and 200 universities. Click here to read the Italian case study. "The century that we are living in cannot be thought of without theory, technology, and the Internet." 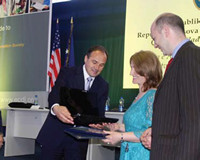 - Enver Hoxhaj, Kosovo's Minister for Education, speaking at an ECDL certificate awarding-ceremony. The Kosovan Ministry of Education, with funding from the World Bank, plan to have 27,000 of the country's primary and secondary school teachers ECDL certified by 2012. Click here to read the Kosovan case study. Click here to read the case study on the role that ICDL plays in the development of the Sri-Lankan education system. "I now prepare all the exams using Microsoft Office Word which saves me a lot of time and effort". - Ali, teacher, Jordan, on how his ICDL certification has benefited his professional life.